You might remember on my anniversary post I was giving away freebies, of sorts. Here are some that didn’t make it into the first batch or that I’ve finished since! If you requested one and I’ve missed you, maybe you could call my attention to it? I had folks who wanted one but didn’t share an armory link and I’ve gotten a bit confused keeping the comments all straight. Anyway, mini-sketches, 5-minutes each, you know the drill. 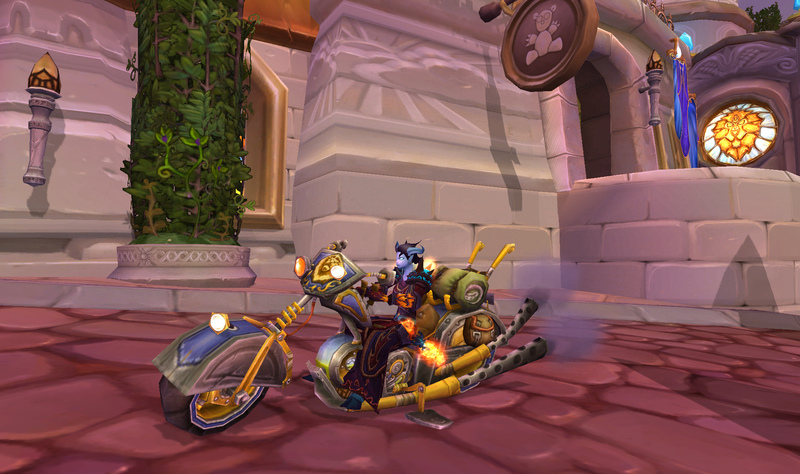 In somewhat related news, you can see the gentlemanly murloc I did for Zelmaru over at Murloc Parliament and check out her snazzy new layout while you’re at it! Rades and Beru each wrote posts that were tear-jerkers for different reasons – Beru’s a moving story of success, Rades’ a lament for a lost friend. 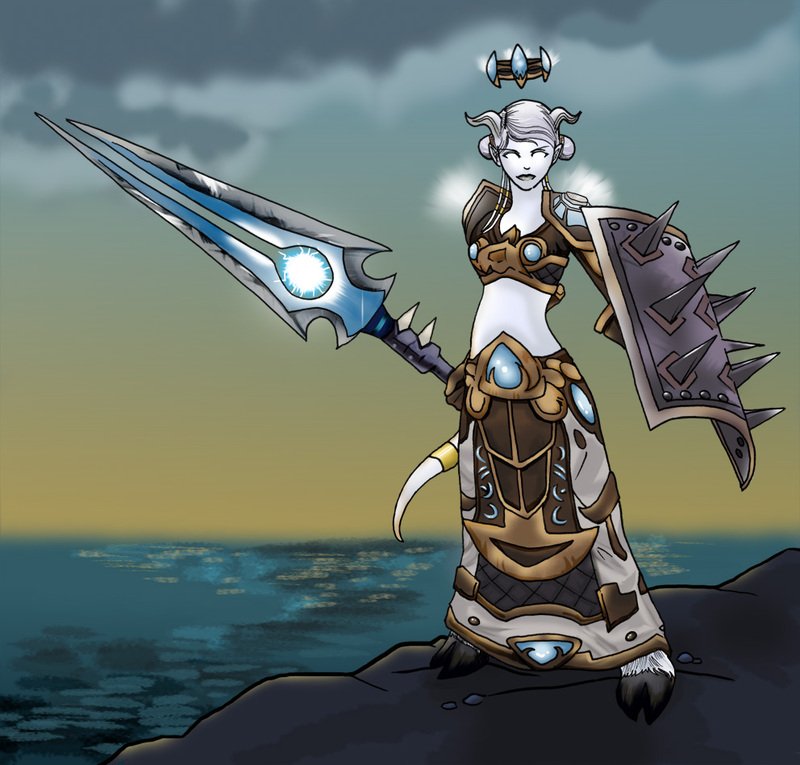 Also, my friend Liala featured me in her comic, Disciplinary Action – after I complained that there was a serious lack of draenei representation. She set out to teach me that the cliche is true – you really do have to be careful what you wish for, because you just might get it. There’s no patch tomorrow, unfortunately. I’ve never anticipated a patch quite so eagerly – I really want those new meta gems. How about you, are you looking forward to the patch for any reason or wish it wouldn’t come? Voss observed cheerfully, “Well, that just means I get another week of being OP!” He has a way of looking on the bright side. I feel both guilty and gleeful about the look on the fish's face. 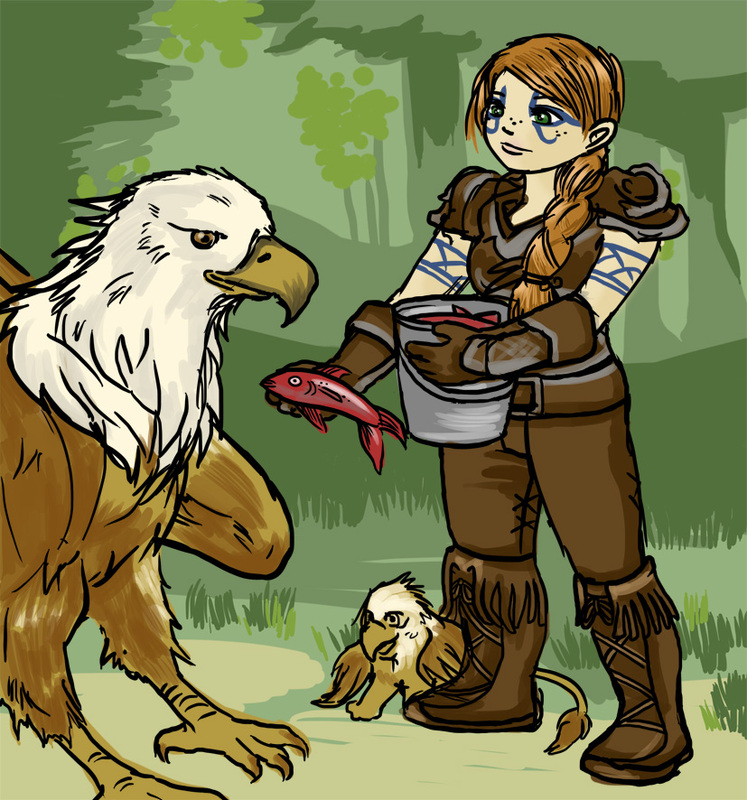 The answers to the question, "What does a dwarf feed her gryphon?" were pretty awesome, incidentally, and ranged from "dead orc heads" to...well, fish. You're probably happy I chose the former. I know that art day posts are a bit boring (what do you say about them?) so I’m combining two time-honored traditions, art day AND link love. I’ve had some links stored away in my file for several weeks now, so it’s time to get caught up! This was a sketch that strong-armed its way into becoming a semi-paint, it’s still a bit rough but for a warm-up sketch, I’m happy with it! (That’s two and a half hours of warming up, by the way). Without further ado, link love! Cynwise wrote a great post about warlock CC, if you’re into that kind of thing, but many of the tips and macros could be re purposed easily to apply to mages or most any other class. It’s a good read! In a similar vein, Ophelie over at The Bossy Pally wrote about all the types of CC there are. I suppose some people feel now that CC is no longer necessary in heroics and everything has become an AoE zerg-fest, but for many of the tougher pulls we’re still CCing. It doesn’t take long and it makes life easier for everyone! I enjoyed Spinks’ short post about the Women of Cataclysm. I’m always happy to see stronger female characters taking a place in WoW! I would hasten to add there are some great Wildhammer characters there too (have you done the quest with the gryphon rider in Deepholm? I won’t spoil it for you, but suffice to say she is tough as nails). Perhaps you’re back into raiding again, but do you know how your raiders learn new encounters? Kae wrote about this a few weeks ago and I thought it was an interesting read. I’m visual and tactile myself, which means the videos don’t generally work well for me (and the talking in them mostly annoys me). A good diagram and some hands-on experience helps me more than anything. Finally, this post is old but I happened across it when the topic came up for us the other night. 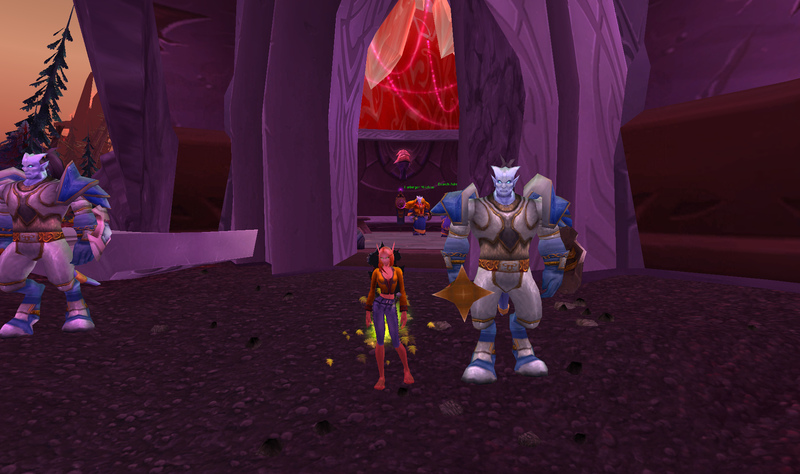 Anexxia’s post The Changing Face of Spirit talks about how the stat fits into Cataclysm gear. Have you decided what your raid is doing about gear with +spirit? It’s something to consider before you are caught unprepared!